Sandia National Laboratories’ Advanced Manufacturing Innovation Initiative included work on a nondestructive inspection (NDI) library for manufacturers. (Photo by Randy Montoya) Click on the thumbnail for a high-resolution image. ALBUQUERQUE, N.M. — Sandia National Laboratories is helping makers of wind turbine blades improve the labor productivity associated with blade fabrication and finishing. This improved productivity makes domestic blades more cost competitive with blades from countries that pay workers lower wages. The Advanced Manufacturing Innovation Initiative (AMII), a three-year $6.3 million project, brought together researchers from Sandia, Iowa State University, and TPI Composites of Scottsdale, Ariz., which operates a turbine blade factory in Newton, Iowa. Sandia manager Daniel Laird said AMII is a collection of small, targeted projects. Of 49 proposals considered by the project committee, the 22 accepted projects included automated laying and finishing, using simulation to develop more efficient manufacturing process flows, and improved nondestructive inspection (NDI) capabilities. The project’s goal is to make U.S. wind turbine blade manufacture economically viable in the U.S. market. In addition to taking advantage of the transportation advantage of in-country manufacture, the project sought to improve labor productivity and reduce the manufacturing time by 35 percent. The Wind Energy Foundation found that the U.S. now has 61,946 megawatts of utility-scale wind power capacity, and utility-sized wind installations in 39 states and Puerto Rico. Though wind energy production is a vital piece of America’s total energy portfolio, high U.S. labor costs have historically made it difficult to manufacture blades in the U.S. competitively. Building blades isn’t easy. Wind turbine blades are large and heavy, and tolerances must be within millimeters of perfection. They must withstand decades of harsh conditions and handle punishing speeds up to hundreds of miles an hour at the blade’s tip. And right now, much of the work of making a wind turbine must be done by hand. 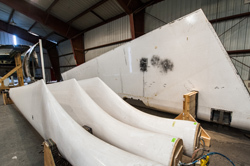 “Wind turbine blade manufacturing consists of a labor-intensive set of highly distributed manual operations including layup of very high volumes of material, infusion, secondary bonding and demolding for many sub-assemblies over a vast manufacturing floor area. All of these considerations make implementation of automation a challenging and expensive endeavor,” Laird said. In one project, Sandia researcher Diane Callow created a factory logic model of the manufacturing plant, allowing researchers to look at process flows and ways to improve product velocity. This work immediately identified and quantified bottlenecks due to an overhead bridge crane. The problems were solved by developing novel, ground-based carts. In another AMII effort, researchers coupled an engineering data software platform to a 3-D laser projection system to improve fiberglass fabric positioning. Researchers also modeled the curing of a higher-performance spar cap, the part of the blade that carries the bending load. Sandia senior researcher Dennis Roach led development of a reference sample library used to train those who perform nondestructive inspection of wind turbine blades. “The NDI project improved the ability of blade manufacturers to confidently determine the quality of their product before it leaves the factory, enhancing the in-service life of the blades. Sandia not only worked to optimize the performance of conventional inspection processes but also developed advanced NDI methods to further improve the quality assurance process. A focused technology transfer aspect of AMII allowed these advanced NDI methods to begin their integration into U.S. blade manufacturing plants,” Roach said. “The combined AMII improvements and innovations reduced the cycle time to manufacture a blade by nearly 50 percent,” Laird said. Sandia President and Labs Director Paul Hommert will participate in a panel discussion on “Manufacturing: From Start-up to Scale-up” at the American Energy & Manufacturing Competitiveness Summit on Wednesday, Sept. 17. Daniel Laird also will be at the summit at the Ronald Reagan Building and International Trade Center, in Washington, D.C. The project is wrapping up this year with a comprehensive project report, which will be made publicly available. Learn more about Sandia’s Wind Energy Program at the program’s website.